Baton Rouge, LA – August 25, 2015 – Lamar Advertising Company (Nasdaq: LAMR), one of the largest outdoor advertising companies in North America, today announced that it is dedicating space on its digital billboards nationwide to commemorate the 10th Anniversary of Hurricane Katrina. Lamar’s billboards will feature iconic photos of New Orleans and the message “10 Years Stronger” to remember those lost in the hurricane and to honor the individuals who came together to rebuild the city of New Orleans. 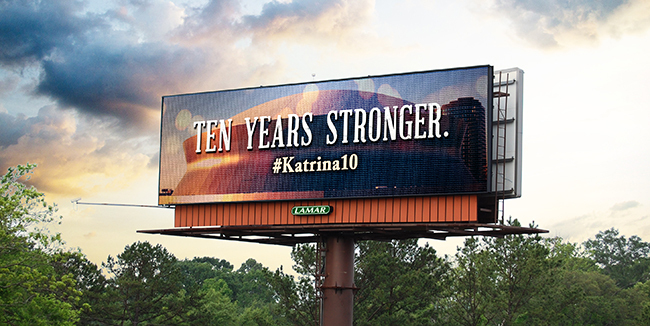 Photos: “10 Years Stronger” message running on Lamar’s digital billboard space to commemorate the 10th Anniversary of Hurricane Katrina (above). 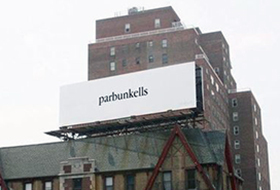 Four designs will rotate on Lamar’s billboards nationwide (below). Hurricane Katrina struck the Gulf Coast on August 29, 2005, causing levee breaches that left much of the city of New Orleans underwater. Ten years later, the city of New Orleans has been revitalized, and the region has grown both closer together and stronger – a message that Lamar is spreading on its digital billboards. “The personal ties, the business ties, the sense that we’re in it together is just far stronger than it was pre-Katrina. I think this will prove a lasting effect,” adds Reilly. 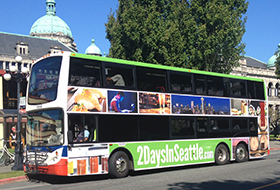 The campaign is running on Lamar’s digital billboard space nationwide from August 25 – 30, 2015.